Last week's challenge: Name a famous person with the initials B.S. and another famous person with the initials G.M. — whose first and last names, respectively, rhyme with each other. One of the names has one syllable and one has two syllables. Who are these famous people? Next week's challenge: This challenge comes from listener Sandy Stevens of Bandon, Ore. What one-syllable word in 7 letters becomes a four-syllable word by inserting the consecutive letters IT somewhere inside? If you know the answer to next week's challenge, submit it here. Listeners who submit correct answers win a chance to play the on-air puzzle. Important: Include a phone number where we can reach you Thursday, Aug. 25, at 3 p.m., ET. August is drawing to a close. Vacation is over. The pools are closing. It's time for school supplies and waking up in time for the bus. But the fun does not have to end. Let's do the Puzzle. 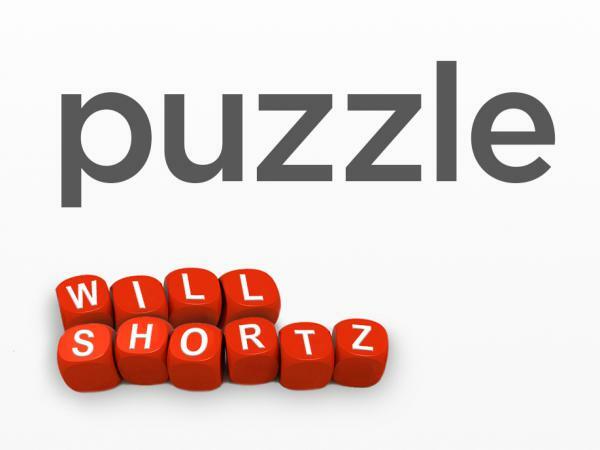 WERTHEIMER: I'm joined by the puzzle editor of The New York Times and WEEKEND EDITION's puzzlemaster, Will Shortz. Hey, Will. WERTHEIMER: Will, this is your birthday weekend, so happy birthday. SHORTZ: Thank you very much. WERTHEIMER: How old are you? WERTHEIMER: Oh, my God, a baby. SHORTZ: So that - does that remind you of a Beatles song? WERTHEIMER: (Laughter) No, I want to know what kind of cake. Do you have a favorite birthday cake? SHORTZ: I am a huge chocolate fan. So - and in just telling everybody right now, if you ever get me something to eat, make it chocolate. WERTHEIMER: (Laughter) OK. So could you remind us of last week's challenge please? SHORTZ: Yes. I said name a famous person with the initials B.S. and another famous person with the initials G.M. whose first and last names respectively rhyme with each other. And I said one of the names has one syllable and the other has two syllables. Who are these famous people? Well, the answer is Ben Stiller and Glenn Miller, the bandleader. WERTHEIMER: (Laughter) Right. And over 970 people got the correct answer this week. Our randomly selected winner is Becky Harter of Lewis Center, Ohio. Congratulations, Becky. BECKY HARTER: Thank you, Linda. WERTHEIMER: So how did you get to the answer? HARTER: Well, ironically, I'd just seen the movie "Along Came Polly," so Ben Stiller just popped into my mind. And I was doing the Puzzle with my husband and he chimed in Glenn Miller, so it was a group effort. WERTHEIMER: How long have you been doing this, playing the Puzzle I mean? HARTER: Well, actually, this is just my second entry, we've - I'm relatively new to the program, so maybe the past couple months. WERTHEIMER: Fantastic. Well, welcome to the show. WERTHEIMER: So, Will, let's do it. SHORTZ: All right, Becky and Linda, every answer today is a familiar eight-letter word. I'm going to give you two three-letter words that are somewhere in it. You tell me the full word. For example, if I said woo - W-O-O - and win - W-I-N - you would say woodwind. And I'll tell you the two words I give you will always be in the correct order, but where they appear in the word is for you to discover. SHORTZ: Here's number one - vet - V-E-T - and ail - A-I-L.
SHORTZ: No, you got to keep the V-E-T together and keep the A-I-L together. SHORTZ: I'll give you a hint - put two letters in front of vet. That's a tricky one. I'll tell you. It's dovetail. WERTHEIMER: Oh, there you go. SHORTZ: Like a joint or a dovetail. SHORTZ: Leg - L-E-G - and ram - R-A-M.
WERTHEIMER: This is a very tough sort of puzzle for me. My mind does not work this way. SHORTZ: Pen - P-E-N - what you write with - and ago - A-G-O. SHORTZ: Urn - urn - U-R-N - and oat - O-A-T.
SHORTZ: That's it. There's your clue. SHORTZ: Turncoat is it. Your next one is pip - P-I-P - and any - A-N-Y. WERTHEIMER: (Laughter) That's a very fancy one. I like that. SHORTZ: Epiphany, one of the tough ones and you got right off. And here is your last one - not, one - N-O-T and O-N-E.
SHORTZ: And here's your hint - put two letters at the start. HARTER: Thank you, thank you. WERTHEIMER: Now, we're going to send you a WEEKEND EDITION lapel pin, as well as puzzle, books and games, and you can read all about it at npr.org/puzzle. And please tell us your public radio station. HARTER: That would be 89.7 WOSU Public Radio in Columbus, Ohio. WERTHEIMER: Thank you very much. Becky Harter of Lewis Center, Ohio, thank you for playing the Puzzle with us. WERTHEIMER: OK, Will, the challenge for next week. SHORTZ: Yes. It comes from listener Sandy Stephens (ph) of Bandon, Ore. What one-syllable word in seven letters becomes a four-syllable word by inserting the consecutive letters I-T somewhere inside? So again, what one-syllable word in seven letters becomes a four-syllable word by inserting the consecutive letters I-T somewhere inside? WERTHEIMER: When you have the answer, go to our website, npr.org/puzzle, and click on the submit your answer link. Just one entry per person please. Our deadline for entries is Thursday, September 1, at 3 p.m. Eastern, so please include a telephone number where we can reach you at about that time. And if you are the winner, we'll give you a call, and you'll get to play on the air with the puzzle editor of The New York Times and WEEKEND EDITION's puzzlemaster, Will Shortz. Thanks so much Will. SHORTZ: Thanks a lot, Linda. Transcript provided by NPR, Copyright NPR.